The increasing use of and dependence on information technology in economic activities - while creating significant benefits in terms of productivity and efficiency - is also leading to significant risks. Among them are "digital security risks" which, when they materialise, can disrupt the achievement of economic and social objectives by compromising the confidentiality, integrity and availability of information and information systems. It is widely assumed that most companies have been, will be, or don't know they have been, affected by such "cyber" incidents. Although quantitative measurement is still emerging and raises significant challenges, the frequency and scope of cyber incidents is growing significantly and cyber risk is viewed as one of the main concerns to doing business. offering a material level of coverage to a large share of companies and individuals at risk. This is not currently the case. 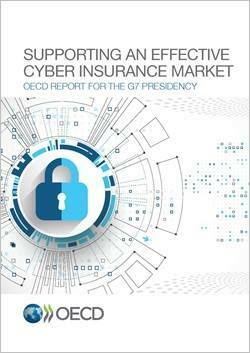 Prepared at the request of the G7 Presidency, this report provides an overview of the market for cyber insurance, including the available coverage and potential gaps as well as the current challenges in terms of data availability, quantification of cyber risks, awareness and misunderstanding about coverage. It identifies potential policy measures to address some of the main challenges to the development of an effective cyber insurance market.